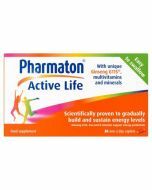 Pharmaton Capsules balance out energy levels throughout the day - reducing Daily Fatigue, exhaustion and hence improving physical and mental performance. If Pharmaton capsules are taken regularly, the benefits should be felt within a few weeks. Pharmaton Capsules is a phyto-based medicine (medicinal products containing plants or part of plants as the active ingredients). Pharmaton Capsules contains a unique plant based extract G115® - extracted from Panax Ginseng. It is the only clinically proven product to relieve Daily Fatigue and is supported by more than 30 clinical trials. The trials demonstrate that the treatment can reduce tiredness and improve physical and mental performance. 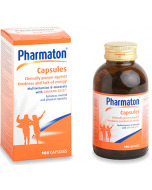 If taken regularly, the benefits of Pharmaton® Capsules should be felt within a few weeks. The treatment works by evening out energy levels throughout the day - reducing Daily Fatigue, exhaustion and hence improving physical and mental performance. 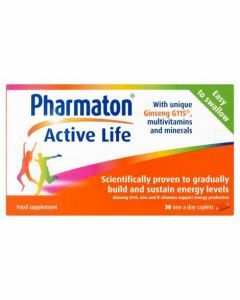 Pharmaton Capsules contains a unique blend of vitamins, minerals, trace elements and the clinically proven, standardised G115® ginseng extract. 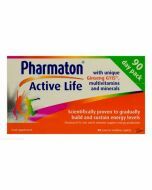 Pharmaton Capsules work by raising the general level of cellular activity, which is expressed by a pronounced increase in the physical and mental capacity. It is also appropriate when exhausted due to stress, poor diet and illness impose additional demands on nutrition and when vitamins and mineral supplementation is needed. Standardised ginseng extract G115, Vitamins, Minerals, Trace elements. On this graph we can see how taking Pharmaton Capsules supplement daily can improve alertness. Those tested have reported that their physical and mental well-being has been much improved. A trial among nearly 400 healthy employed subjects of both sexes over the age of 25 was carried out to establish how dietary supplements such as Pharmaton® Capsules could have an influence on overall quality of life, including general mental and physical well-being and healthiness. 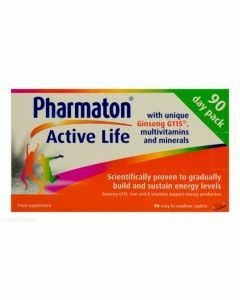 After a 12 week period, it was clear that those people who had been taking Pharmaton® Capsules, including multivitamin/mineral and Ginseng G115, were reporting improved levels of alertness, their ability to relax and a sense of improved general health, when compared to those people who were simply taking a placebo.